Nous n'assumerons aucune responsabilité pour l'exactitude, la perfection et la réalité d'informations fournies. Les prix ou les offres montrés peuvent changer sans davantage d'avis. Nous sommes contre les cookies. Nos pages sont entièrement fonctionnel avec cookies désactivés. l est notre objectif de soutenir votre hobby pour garder vos machines aimé courir. Il a été démontré dans le passé, que l´enthousiasme de quelques collectionneurs seulement, sauvé de nombreuses appareil d´amusement du recyclage. Le problème est la disponibilité des pièces de rechange qui courent quant à court ou, même, ne doit plus exister. Nous sommes heureux d´enrichir notre hobby, de temps en temps avec quelques innovations et met en évidence. ous avons mis une grande valeur lors d´élever seuls des produits sélectionnés dans notre gamme équilibrée et de marchandises. Outre les nouveaux éléments que nous offrons rares pièces de rechange et composants de machines qui vont au recyclage. Des méthodes contrôlant assurer que vous obtenir des objets entièrement fonctionnel et propre. ote Remarque pour nos clients étrangers hautement respectée: Nous sommes sur le point de traduire le contenu de notre site vers d´autres langues. Toutefois, compte tenu de la masse énorme de publications comme nos pages web, dépliants, manuels, etc, nous traitons les uns après les autres. Donc, si vous ne trouvez pas votre document apprécié au moins en anglais, s´il vous plaît, soyez patient avec nous. Si vous ont cruellement besoin l´un de nos documents traduits, donnez-nous une courte note. Merci pour votre patience. sprovided by Hartmut Litfin from FLIPPERSERVICE.COM. p style="font-size: 0.8em">Legal note: Clicking the image will link you to Youtube. We are not responsible for your personal data (IP, access time etc.) transmitted. Also, we do not know and have no influence, how your data is processed by Youtube. ABSOLUTELY NO SMD parts. Wired components only! 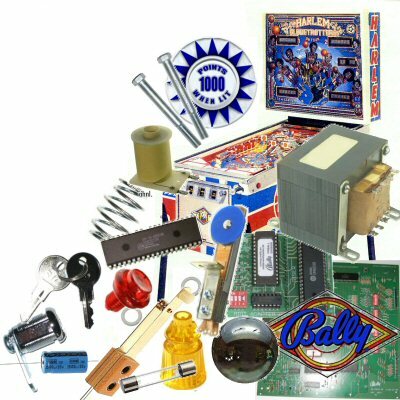 Replacements parts (except ASIC) available for, at least 10, years! 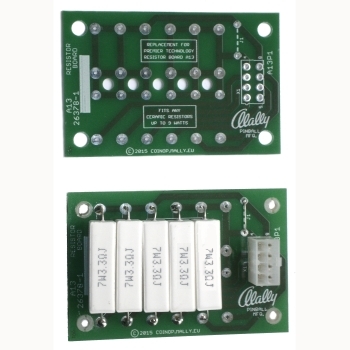 Adapter Boards to allow flicker free usage of LED Bulbs. 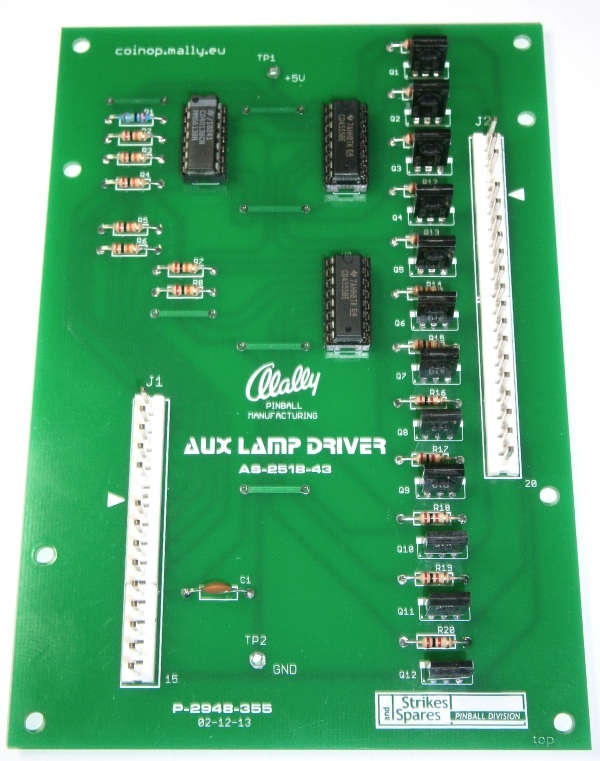 Can be used in all BALLY, MIDWAY and STERN machines equipped with Lamp Driver Board AS-2518-23 or STERN LDA-100. This errata solves a problem, where a radial component may touch a via right below its location, due to the shape of a bend component wire. 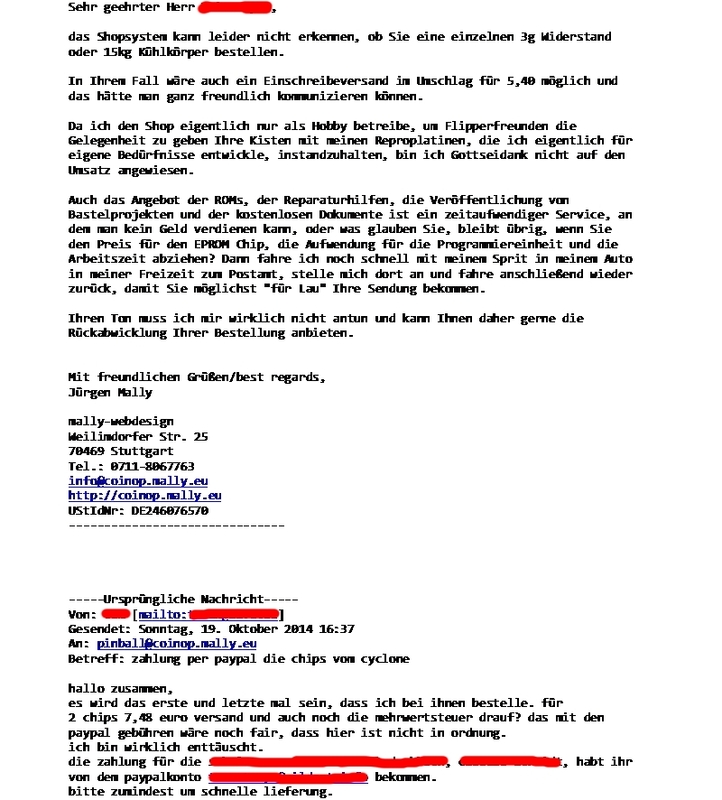 Please note, the project documentation is in German only. By the use of special machines we are happy to offer axial parts readily cut & bend to a pitch of 12,7 mm which was commonly used by BALLY/WILLIAMS. 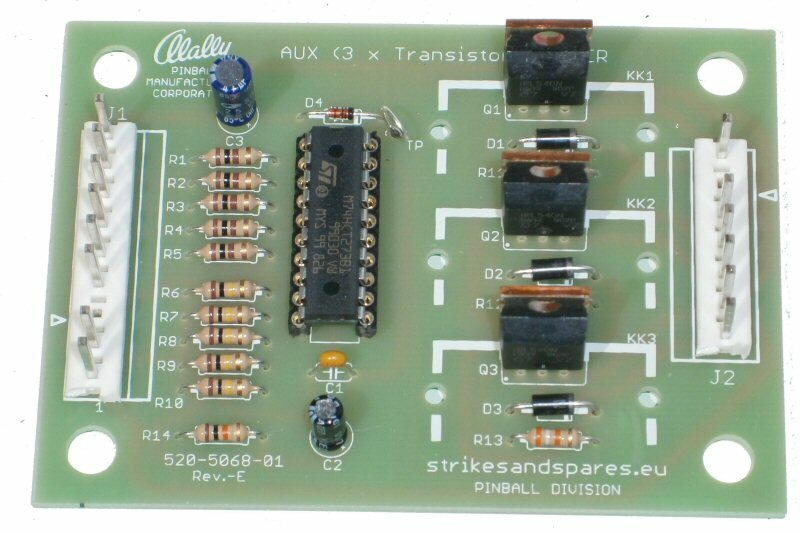 This pitch was used on BALLY und WILLIAMS pcbs from 1977 to 1985 mainly for diodes, resistors and axial capacitors. Please accept, that this offer is valid for 100+ pcs. only. If desired, give us a short note after you completed your order. For the last batch of our MPUs we assembled HCF4049 CMOS components on location U14. These may result in flickering lamps, especially when equipped with LED bulbs. For future productions we switched to CD4049. If you want to replace the IC, please contact us. We will ship a replacement part for free. Please provide the order no. if available. 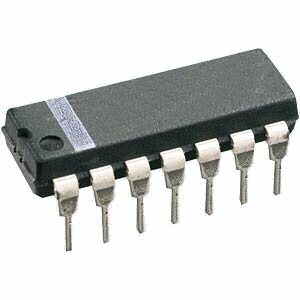 Exchange of the part is easy, as all ICs on our boards are on sockets. Notre BALLY VOCALZER sera prêt pour la livraison de 1 semaine. 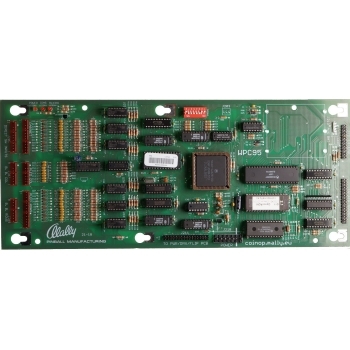 En raison du fait que cette carte a été utilisé seulement dans XENON et FLASH GORDON production est limitée à 25 pièces. Now also produced in house: WILLIAMS OPTO Sender (16908) and Receiver (16909) for "giveaway price". 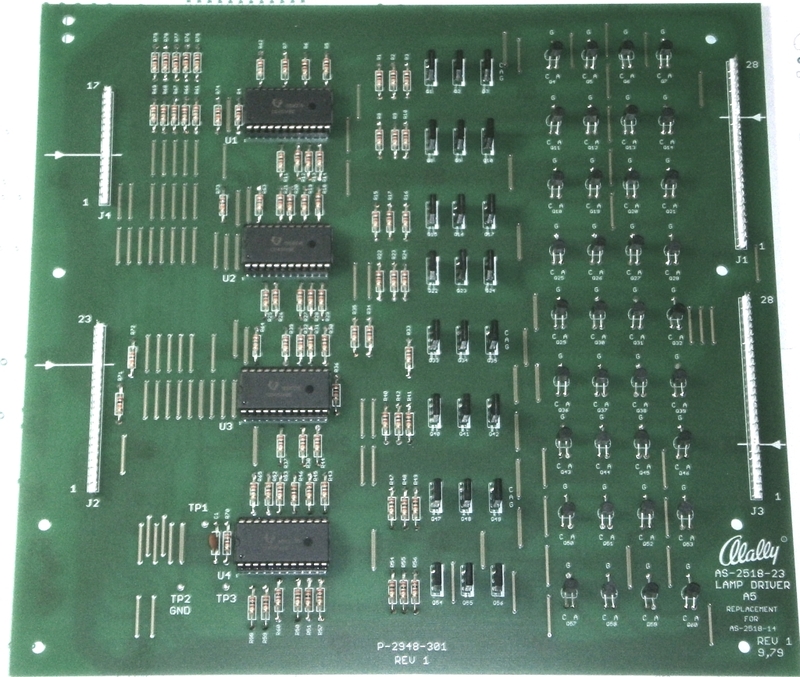 We are manufacturing these boards in original size and shape populated with high value opto components. 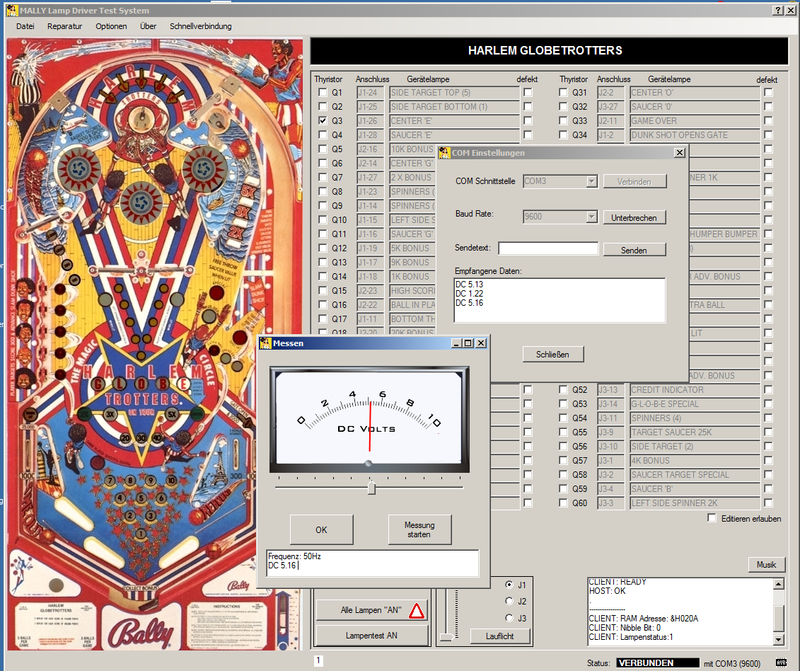 We decided to run a 24/7 Test on 4 real BALLY displays. If the parts will last for, at least, 3 month of non-stop operation, we gonna sell them here for CHEAP! Update (01.09.2015): All tested components overcame the test phase and are still fully functional. We decided to classify the chips as suitable regarding the demands. 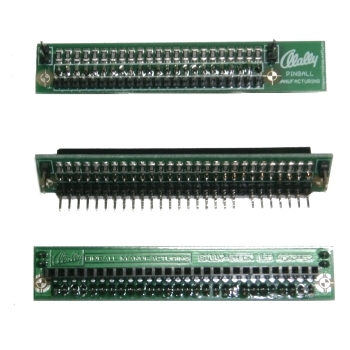 We again could source the obsolete and hard to find HARRIS CVSD Chip in a limited quantity. The DETAIL page of the product monitors the recent quantity in stock. Dans le passé, nous sommes souvent brûlé cartes GOTTLIEB Résistance, nous avons donc décidé de faire une reproduction améliorée . Pour une meilleure management de la température, nous utilisons des résistances plus robustes sur toutes les cartes. En outre, la carte a été repensé pour utiliser traces étendu sur le bas et le haut de la platine. 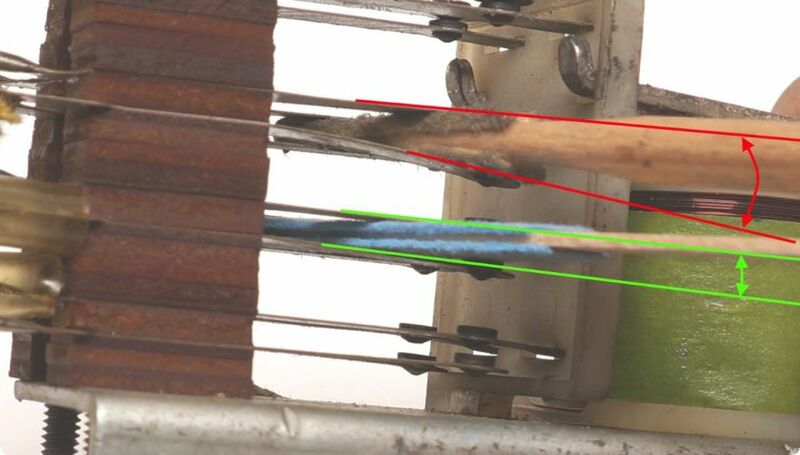 Toutes les autres caractéristiques, comme connecteur, la taille et la position de forage restent inchangés. 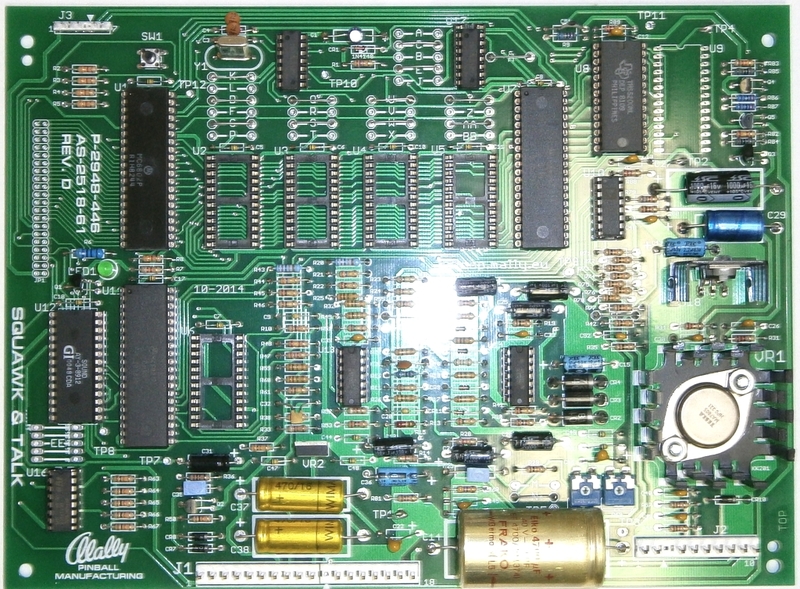 iTESTER is a small device to check the synthesizer chips AY-3-8910, AY-3-8912 and YAMAHA YM2149 for proper operation. 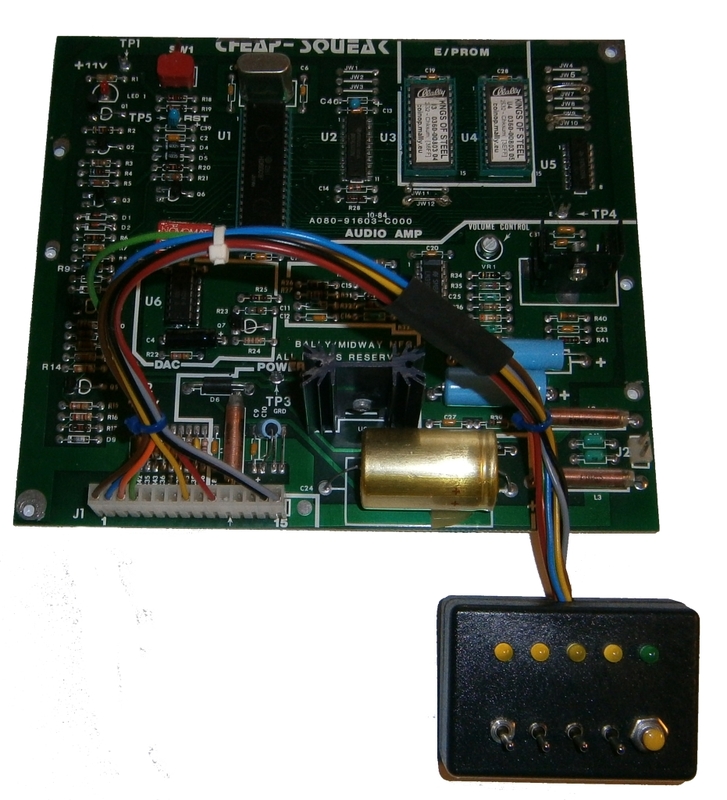 This task is performed by an ATmega32 (8Mhz), a SD card and a small 1 watt audio amplifier. 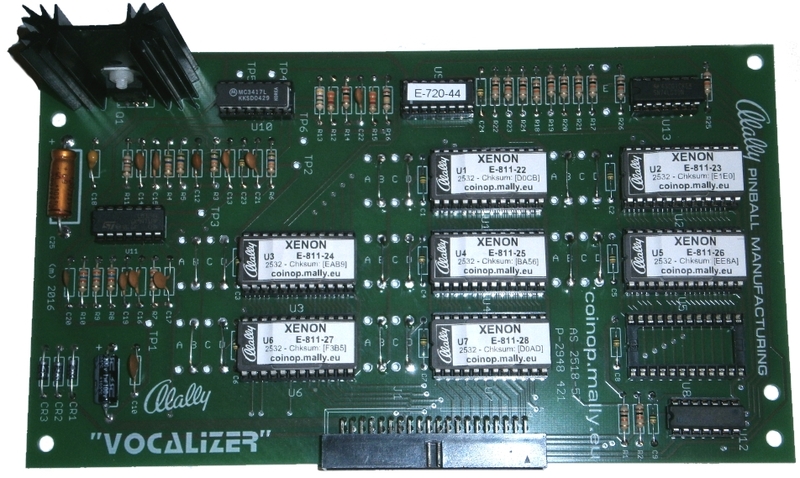 The board contains a 40-pin and a 28-pin Zero-Force-Socket. 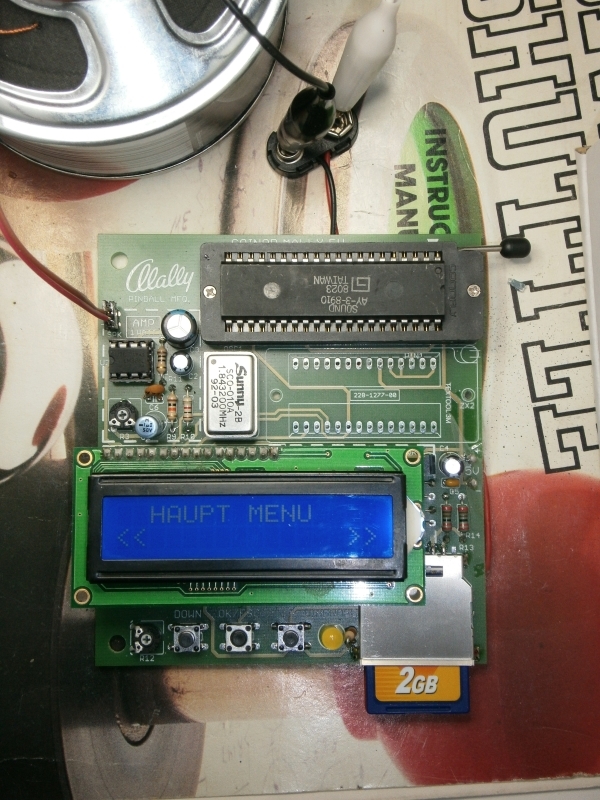 The user menu is shown on a LC-Display, 5 LEDs are monitoring binary values. Additionally, the device uses speech output to navigate through the menu, thus, the device can be operated even w/o LCD. All functions are selected by 3 buttons. As a highlight the noard contains a CHIP TUNE Player, which is able to play non-compressed YM6 files by the synth chip inserted. For this purpose the crystal can be exchanged to match the target chip and recommended frequncy of the tune selected. Hit DETAIL to download a small movie (30MB) showing the operation of the device. 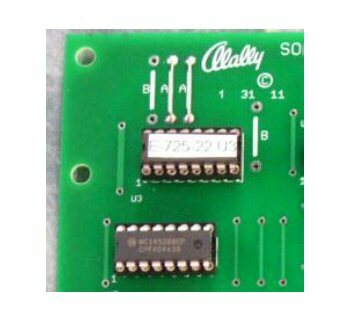 BALLY AS-2518-61 SQUAWK & TALK Repro available now! 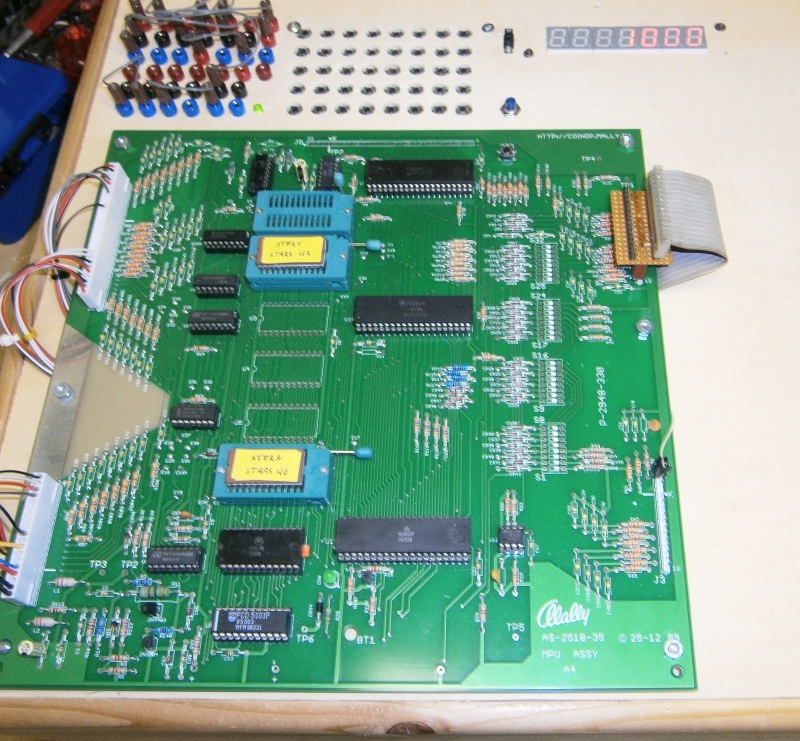 our BALLY SQUAWK & TALK AS-25-18-61 Repro is in production now. 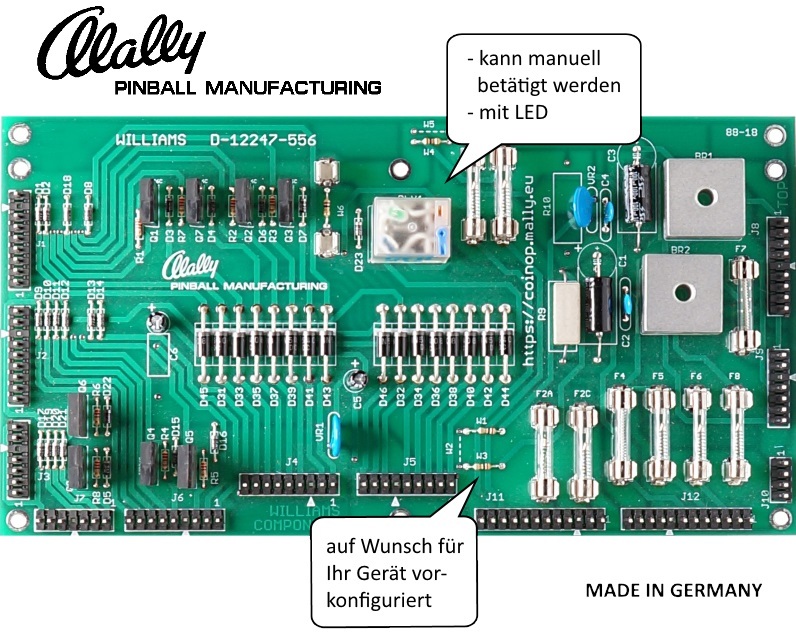 NEW REPRO BOARD: BALLY AS-2518-23 available now. 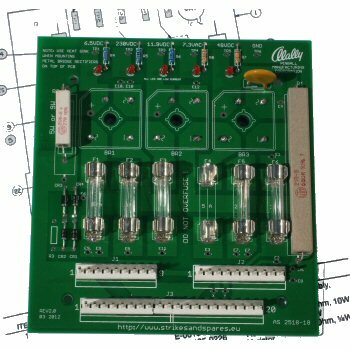 Our new high quality board is 100% compatible to the original board regarding size, shape, drills and operation. Well, we did it! And be sure, there are NO SMD components. 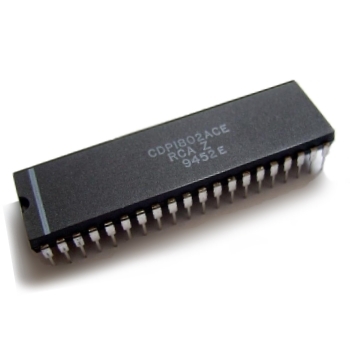 We decided to reproduce version C-8226 because we stock a large quantity of CVSD Chip MC3417 (IC1). The CVSD 55516 and successors are highly obsolete. 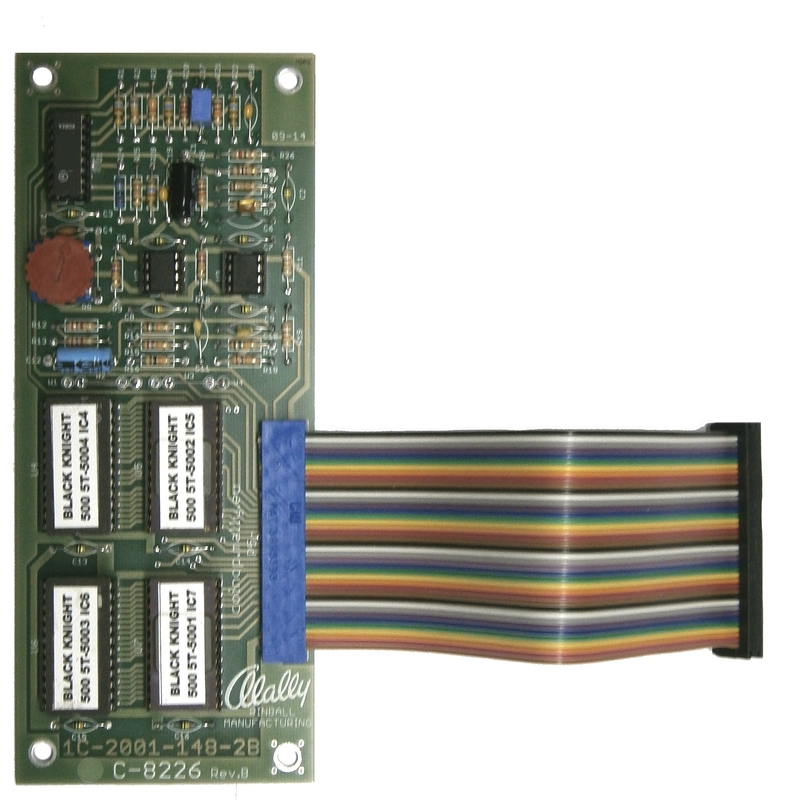 The board was extended to allow use of 2732 or 2532 Eproms. 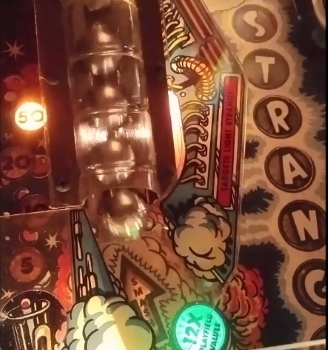 We even sourced the special board-to-wire connectors to keep the Look & Feel close to the original. As usual, our boards can be maintained using the original schematics. Dimensions, holes and layout allow easy Plug&Play. Board will be shipped completely assembled and configured incl. ROMs (2732) for your desired game. Nous proposons actuellement une petite édition des cartes B 18555-1. Depuis ce conseil est tout simplement défaut dans certains de nos achats, nous avons décidé de reproduction. Dimensions, forme, et des trous de fonction correspondent à l´original. Pour votre sécurité: Notre boutique en ligne est maintenant codé SSL. L´adresse certifié de GEOTRUST est https//:coinop.mally.eu. 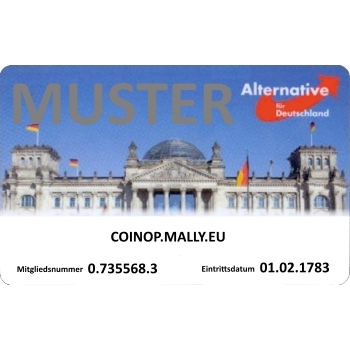 Accès non sécurisé à coinop.mally.eu ou www.coinop.mally.eu est automatiquement relié à notre serveur sécurisé. Ainsi, vous pouvez utiliser vos paramètres favoris ou des liens direct vers nos sites comme vous le souhaitez. Limited quantity available (cuz used in a few machines only). 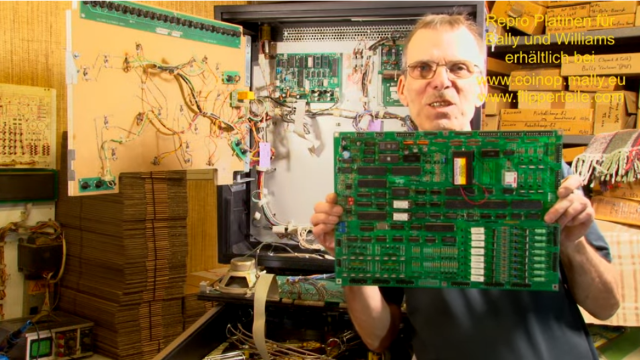 Nous avons peut acheter un bon nombre de ces rares circuits en boîtier céramique à partir du stock d´un retraité. 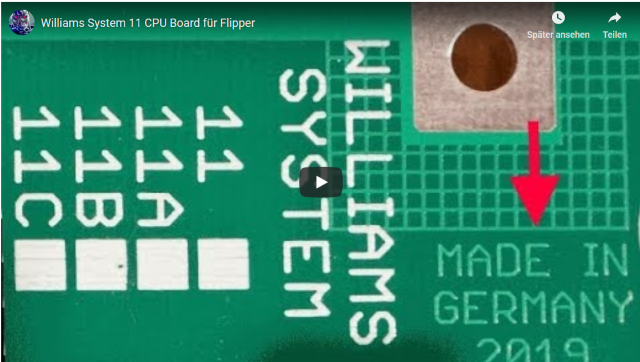 Ce Clock Driver est utilisé sur WILLIAMS MPU avec CPU 6800. Si disponible, ce circuit intégré est cotée 10-20 euros . 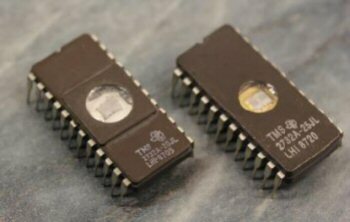 Service-Bulletin: Verwendung von Texas Instruments TMS 2732(A) Eproms auf BALLY AS 2518-17 und -35 MPUs. 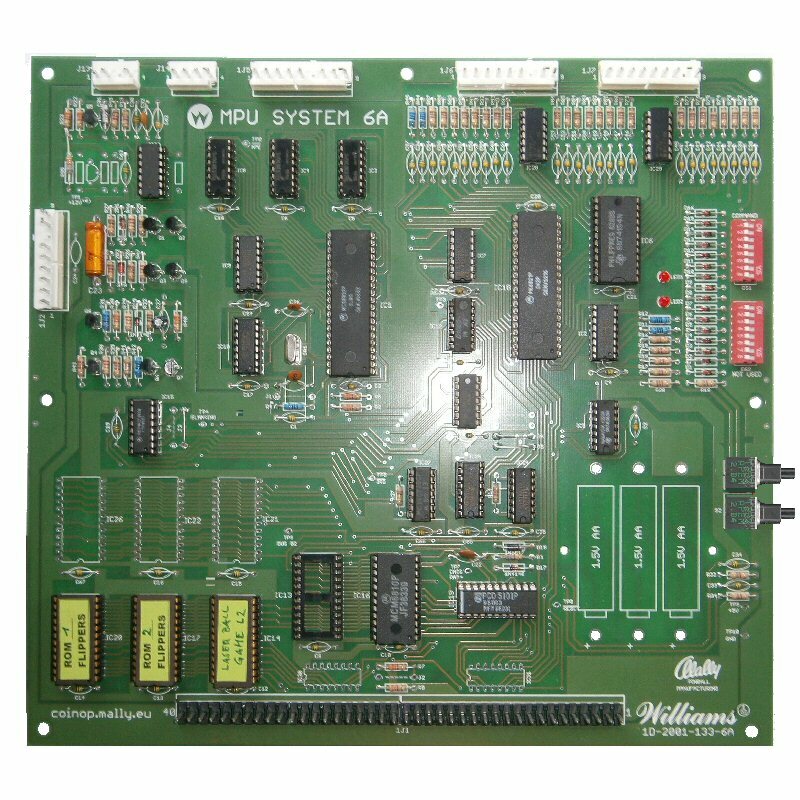 Our reproduction of the WILLIAMS System 6A MPU ist available now. 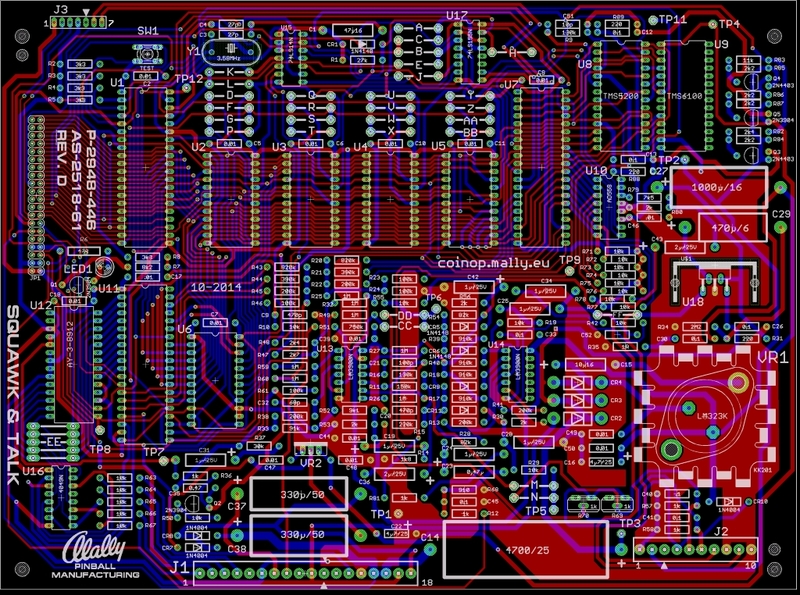 Size, shape and components layout is close to the original MPU. 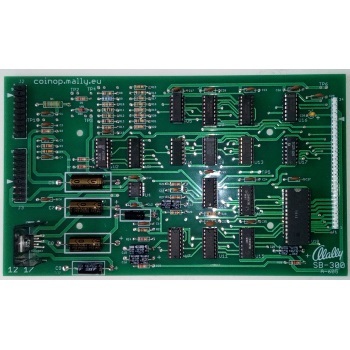 The PCB is manually assembled with original or better parts. 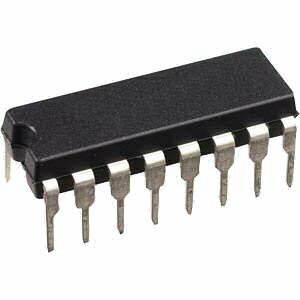 All integrated circuits are on sockets. 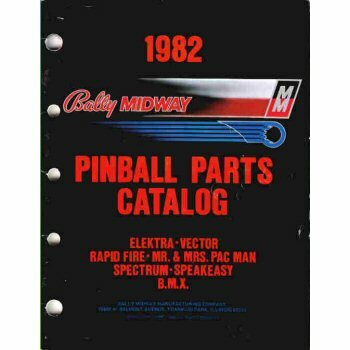 You may use the original schematics for maintenance. Even the 40 pos. 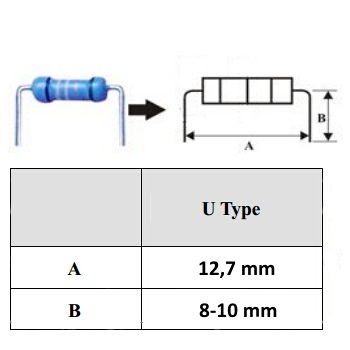 interconnector is populated with custom made extra long headers. Promotion price for a readily assembled (Plug&Play) MPU, incl. 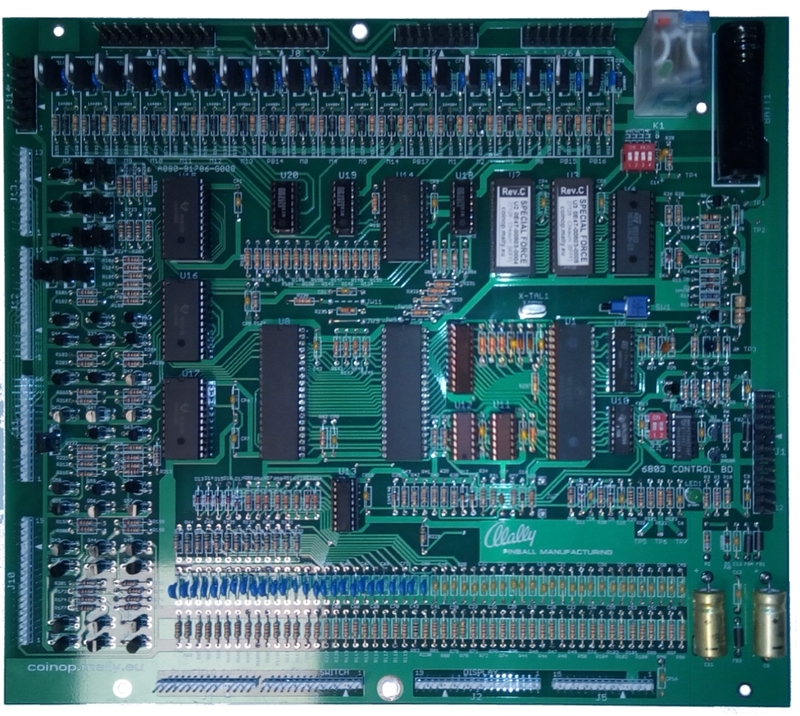 ROMs as desired (PROMs 74S474 are charged additionally) is EUR 169,95. This offer is limited to 31.08.2013. First come, first serve! 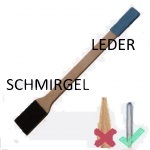 Zudem wurde ein Stromsparmodus eingebaut, welcher einen Ein-/Ausschalter erübrigt. 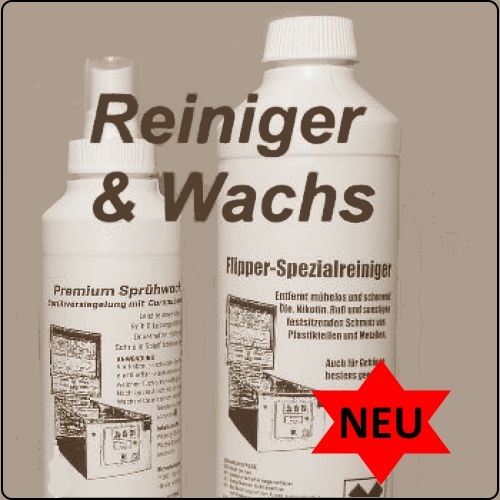 Mit neuen ALKALINE Zellen kann das Gerät ca. 3-1/2 Jahre !!! im Standby-Betrieb verbleiben. 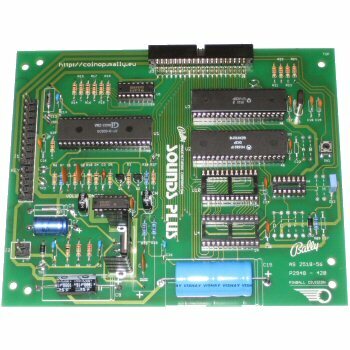 Due to our *nagging* GOTTLIEB friends we focused the SYS 1 Driver Board which is available now. As usual, we are close to the original. No weird components, no fancy stuff. 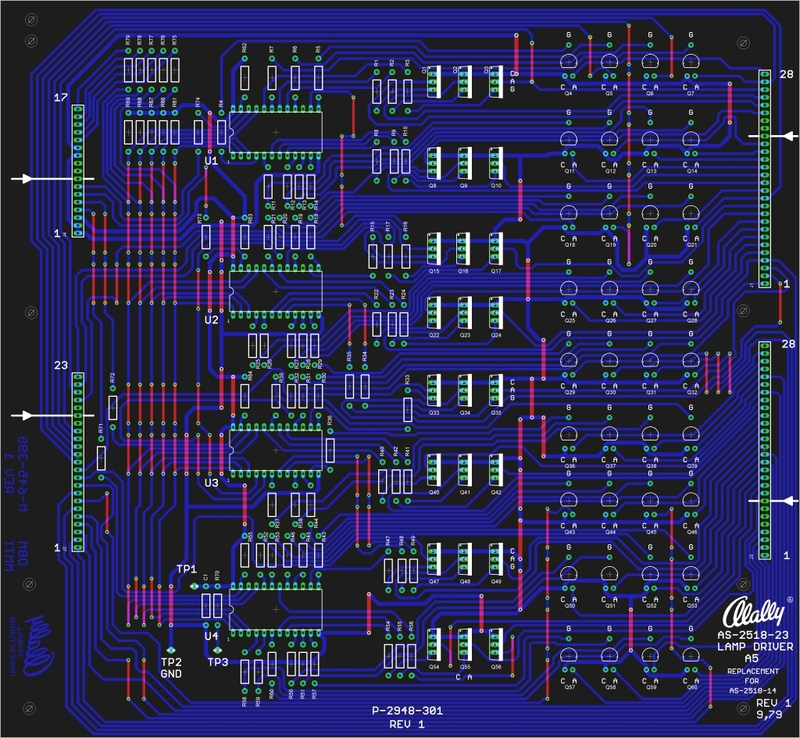 Our board and its layout meet the schematics in your manual. Same look, same feel. We also have tons of the - so called - obsolete parts. 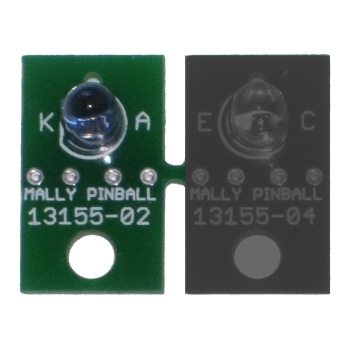 A Blank PCB is also available. Compact new module, highly reliable due to modern components and reduced heat dissipation. For all SYSTEM 1 games. 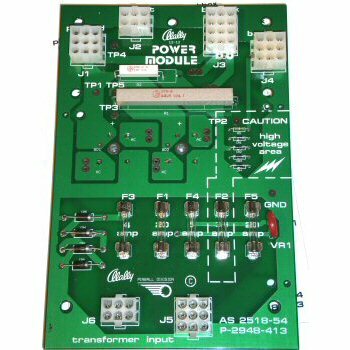 Our BALLY Power Module AS2518-54 Replacement Board is now available as kit or readily assembled. 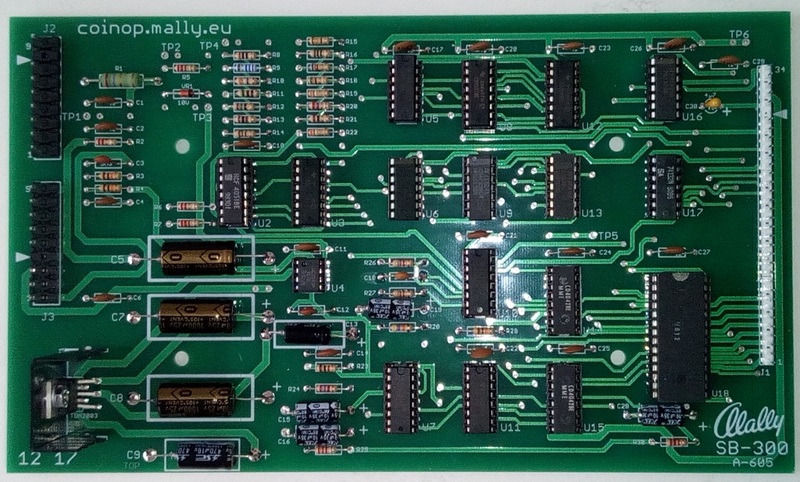 Revision C of our BALLY AS2518-81r repro PCB arrived. 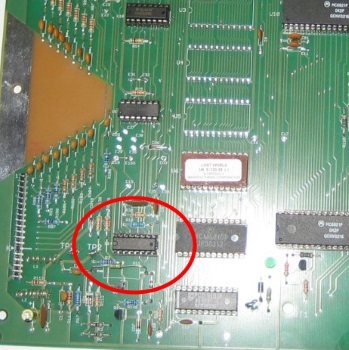 The new reproduction pcb is completely compatible to the original BALLY AS21518-81 SAY-IT-AGAIN Board. 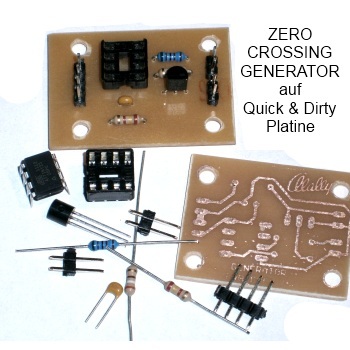 Available as readily assembled module (P&P) or as kit. 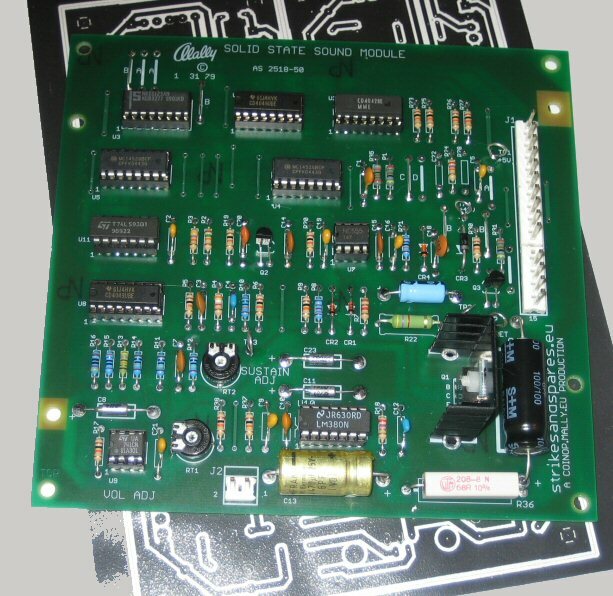 Although, the new pcb is industry quality, prices remain the same. 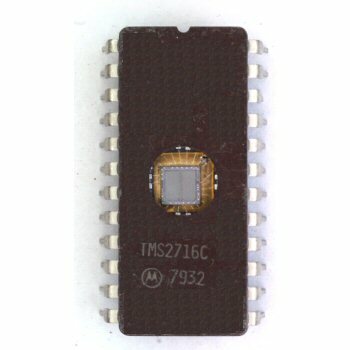 You can find TMS2716 in SPACE INVADERS and other boards. Now it is easy to replace these chips, no fiddling with standard 2716. NIGHT RIDER and FREEDOM U1 & U2 Original-PROMs (512X8) available again. 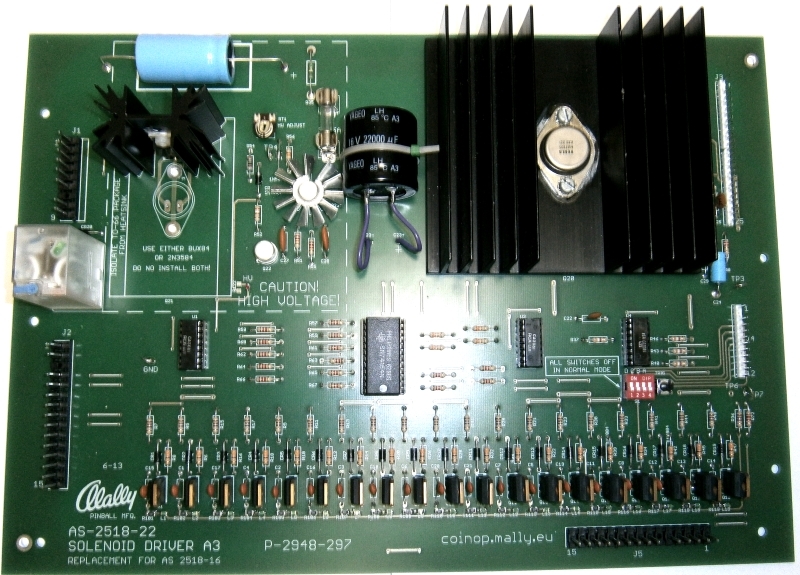 Our reproduction of the STERN Aux Driver 520-5068-01 ist now available on professionally manufactured pcbs. High qualitiy reproduction with many features and improvements, now available. We tried to find an arrangement with Rottendog to sell their boards but, unfortunatelly, they completely ignored our inquiries. As a result, the first samples in strikesandspares quality will be available from August, 1st. The kit w/o ASIC/Security chip will be well below US$100,00. 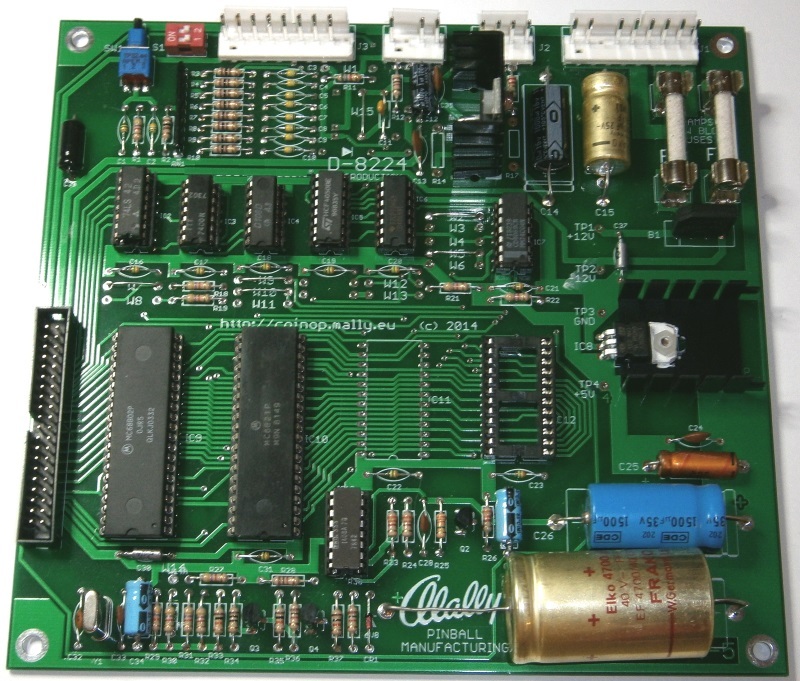 Completely assembled PCBs w/o ASIC/Security will sell for as low as US$139. We also sourced significant quantities of ASICs and Security chips so we can promise a long-term supply of these spare parts for decent prices. More WPC boards will come throughout 2012 / 2013. 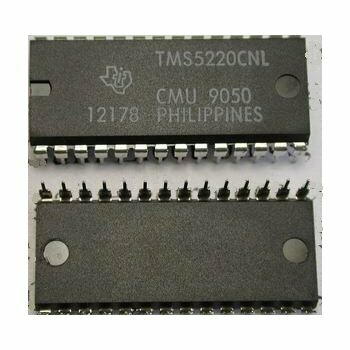 We could source a limited ammount of TMS5220CNL. 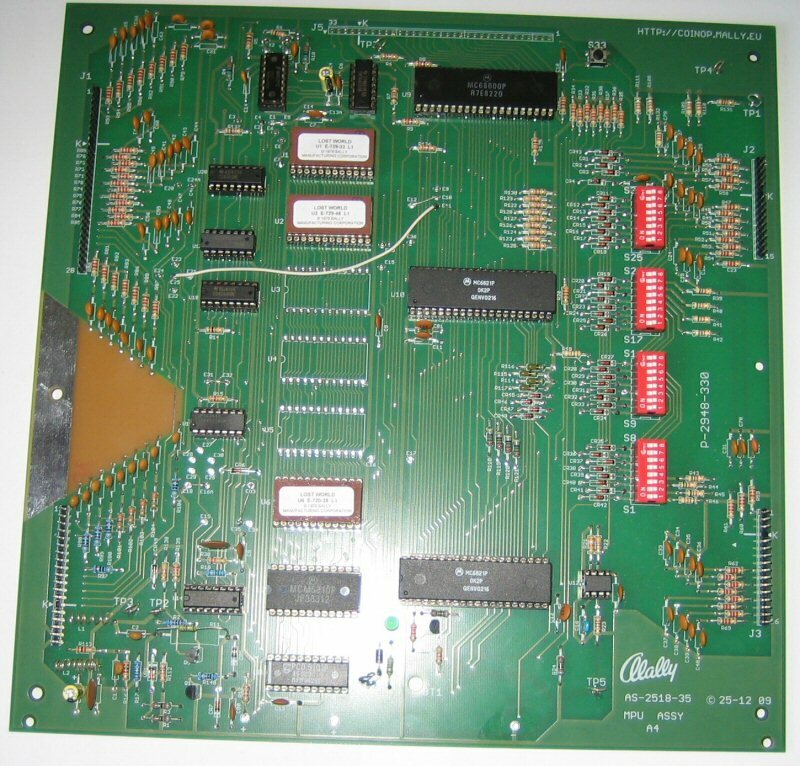 This speech synthesizer was used in many Arcade Games and ZACCARIA pinball machines. Get your parts as long as available. 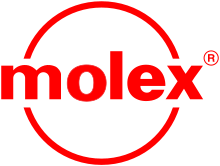 We were happily sourcing many obsolete MOLEX parts, especially the old card edge connectors for GOTTLIEB SYSTEM 1 a.o. We also stock crimp terminals and tools. This special bipolar PROM (32x8) is getting harder to come by and prices are rising continuously. 15 pcs. 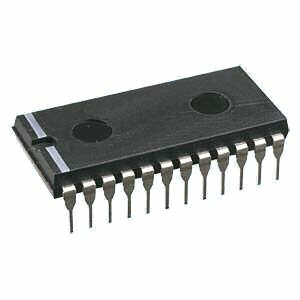 NOS HD38880BP Speech Synthesis IC available. 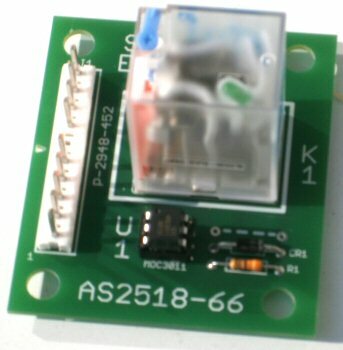 Was used altogether with Eprom Interface HD38882. Tis component is also available in small quanties. Unobtanium, and in general insanely expensive. Now 50 pcs. (Stand 26.04.2011) for as low as EUR 9,95 / ea. available. (Stand 17.05.2011) 11 pcs. left. (Stand 19.05. 2011) SOLD OUT!!! 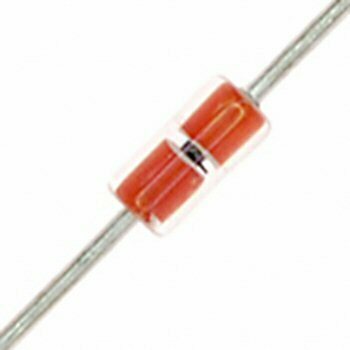 We got our hands on a small NOS quantity of the 1N5275B Zener diodes. 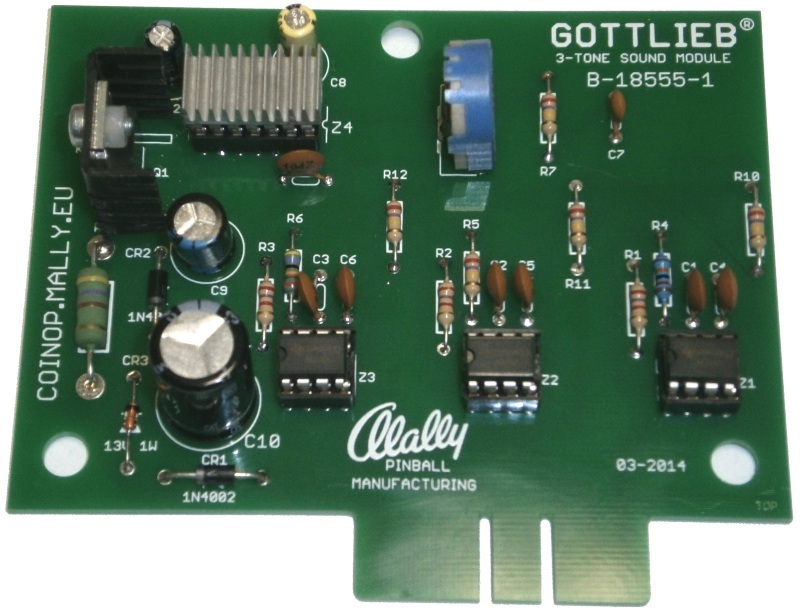 Perfect for a revision of the HV Section on BALLY Solenoid Drivers. e were able to source a remarkable quantity DM9602 (NOS, Date Code: 1979), so we could lower the price. Get your stock as the component is really obsolete. Available as kit or readily assembled PCB. We will prepare the MPU for your ROMs if desired.